1. A Naked Youth Seen from the Side, Perhaps Robert Blake, c. 1779-80 (Butlin 71). Reproduced by permission of the Trustees of the British Museum. explained by the assumption that the first John died in infancy, though there is no record of his death. Blake himself, in describing the second John as “the evil one” (E 721), left no doubt of his existence, but almost nothing is know of his life.6↤ 6 See Tatham in BR 508-09 and Bentley, BR 509n1 and n2. The name of Richard is another puzzle, since he is never mentioned again in the Blake records. If, like the first John, he died in infancy, this fact is not recorded, although the death or burial dates of young children are found fairly often in parish registers of the time—witness those of four young siblings of Catherine Boucher Blake.7↤ 7 BR 5. And most puzzling of all, nowhere in the St. James Parish register is the birth or baptism of Blake’s beloved younger brother Robert to be found. 2. The Approach of Doom. Relief and white-line etching. Reproduced by permission of the Trustees of the British Museum. 3. Milton 37. Copy D. Courtesy of the Library of Congress. Parish register, Bentley proposed that some time after his daughter’s birth in 1764 James Blake Sr. joined the Baptist Church and so never had the infant Robert baptized. In support of this theory he noted that one “—Blake” (no Christian name given) was listed among the members of the Grafton Street Baptist Church from 1769 to 177210↤ 10 BR 7-8. —two years after the conjectured date of Robert’s birth, it should be noted. While Bentley thought it possible that the Royal Academy student was not related to Blake, he dismissed the idea as “unlikely,” seeing “no good reason to challenge [the] accuracy” of the entry as “the only record of the birthdate of Blake’s favorite brother.” And from the time of the publication of his Blake Records this hypothesis has been almost unanimously accepted as the solution to the puzzle of Robert’s birthdate and non-baptism.11↤ 11 BR 20 and n3. Only David V. Erdman (Blake: Prophet Against Empire [3rd ed. rev., Princeton: Princeton UP, 1971] 98) keeps to the earlier conjecture of a 1762 birthdate for Robert, without, however, alluding to Bentley’s hypothesis. 4. The Approach of Doom. Pen and sepia wash (Butlin R2). Reproduced by permission of the Trustees of the British Museum. And yet some doubts remain. A number of small facts or inferences—none of them decisive evidence taken singly, but certainly suggestive in their totality—point in another direction. First of all, the assumption that the Robert Blake who entered the Royal Academy Schools in 1782 was in fact Blake’s youngest brother is questionable, given the “hosts of Blakes” living in London at the time.12↤ 12 See BR 22 and n1, 553-54. Bentley himself collected some 23 London contemporaries who bore the name of William Blake, one of whom was also an engraver, and today “Robert Blakes” are at least as common as “Williams.”13↤ 13 Bentley, N&Q 210 (1965): 172-78; see also Symons 26-28. Today there are eight Robert Blakes (plus three Williams) listed in the Manhattan telephone book. The current London telephone directory unhelpfully identifies most of its subscribers merely by their initials, but it does list two “Roberts” among 35 “R. Blakes,” with only nine “W. Blakes” and no “Williams.” This profusion of Blakes also undermines the probability of the nameless “Blake” of the Grafton Street Baptist Church being Blake’s father, the premise of Bentley’s explanation for the absence of a baptismal record for Robert. Furthermore, it is striking that not one of Blake’s early biographers—neither Malkin, to whom Blake described his own experience at the Academy, nor Smith, who knew Robert personally, nor Tatham, who got his information mainly from Catherine Blake14↤ 14 It might be noted that Robert’s supposed admission to the Academy occurred only four months before Blake’s marriage in August 1782, which would seem to ensure that Catherine knew of his studying there. —spoke of Robert’s studying at the Royal Academy Schools, certainly a noteworthy event if it actually occurred. And if, as seems likely, Blake continued attending the Schools for a full six year term after his admission in 1779,15↤ 15 See Aileen Ward, “Sir Joshua and His Gang,” Huntington Library Quarterly 52 (1989): 78-79. the brothers’ overlapping terms would be a still more notable circumstance—though if, as is generally assumed, Blake left the Academy in disgust after a few months, it is hard to see why Robert would have decided to apply there two years later. Nor can Robert’s surviving drawings be taken as evidence of Academy tutelage. While his work reveals some genuine talent, not unlike Blake’s own in theme and mood, it is an undeveloped one, showing neither the precocious ability that would have gained him admission to the Academy at the unusually early age of 14 nor the influence of Academy training thereafter16↤ 16 Only eight boys (including John Flaxman) aged 14 or younger were among the 414 students admitted to the Schools prior to Robert Blake in 1782 (see Hutchison 313-46). 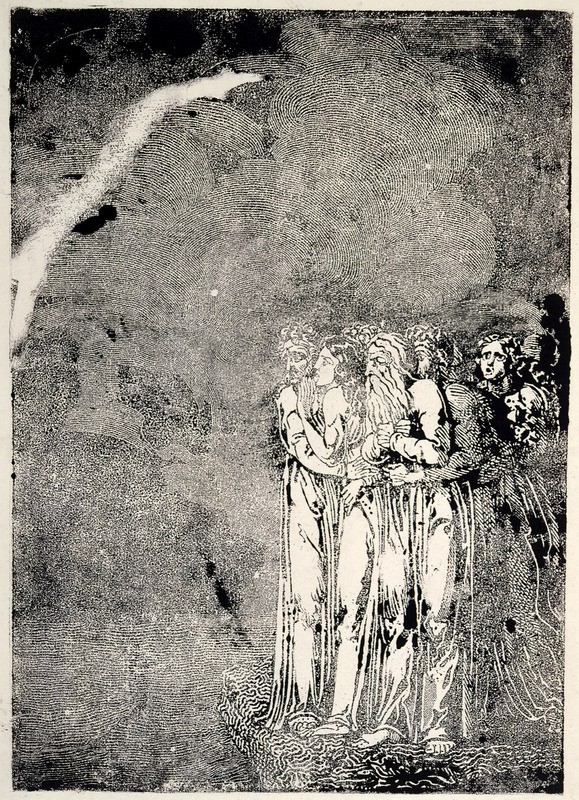 On Robert’s “barely passable” drawing, as for example in “The Approach of Doom,” one of his latest works (1785 according to R. N. Essick, The Separate Plates of William Blake [Princeton: Princeton UP, 1983] 12), see David Bindman, Blake as an Artist (Oxford: Phaidon Press Ltd., 1977) 40. —though of course there is no record of how long he remained there if he actually enrolled. Yet since it appears that Blake at some point tutored Robert in drawing—“a task which he must have found above all others delightful”—this has been taken to imply that the older brother was preparing the younger to qualify for admission to the Academy.17↤ 17 BR 29 and 20. This would seem to strengthen the likelihood that Robert was actually the student of engraving admitted to the Schools in 1782, and indeed it appears a remarkable coincidence that two Robert Blakes both born in the 1760s should both be training as engravers at the same time.18↤ 18 As G. E. Bentley has argued in correspondence, noting also that there is no record of either one being formally apprenticed or later continuing in the profession. Yet a number of similar duplications occur in the roster of the Royal Academy Schools which—like that of Blake’s namesake engraver—considerably diminish the coincidentality.19↤ 19 Counting only students born within a dozen years of one another and enrolled in the same field, we find the following pairs: among architects, two Richard Hollands (born 1750 and 1752), two George Moores (born 1806 and 1810), two James Pennethornes (born 1801 and 1810), two Charles Smiths (born 1790 and 1792), and two George Smiths (born 1782 and 1790); among painters, two pairs of John Grahams (born 1755 and 1766 and 1792 and 1795 respectively), two William Rosses (born 1795 and 1798), two William Turners (born 1763 and 1774), and two George Wards (born 1789 and 1801). Simple duplications of names among the 1551 students enrolled between 1768 and 1830 are too numerous to include (cf. Hutchison 183-91 passim). As for Blake’s teaching Robert, the story stems from Smith’s mention that William “considered him [Robert] his pupil” around the time Blake opened his printshop with Parker,20↤ 20 BR 457—a point echoed by Cunningham (BR 482). and since the discovery of the name of Robert Blake in the Academy roster it has been fortified by reference to the Robert Blake Sketch Book, first described by Geoffrey Keynes in 1949.21↤ 21 Keynes 4-5. This rather decrepit notebook containing about 50 pages of drawings is inscribed “Robert Blake’s / 1777 Book” on the front cover, with similar signatures elsewhere and seven occurrences of the date 1778.22↤ 22 Martin Butlin, The Paintings and Drawings of William Blake (Oxford: Clarendon, 1981) 1: 617; Essick, The Works of William Blake in the Huntington Collections (San Marino, CA: Huntington Library, 1985) 235-36. Many of the pages contain competent sketches of various parts of the human body on the left hand side, apparently by some instructor, with rather hesitant copies filling up the rest of the page, progressing from lips, noses, eyes, hands, arms and legs to faces, busts and full figures.23↤ 23 Butlin 1: cat. R1; 2: pls. 1126-1177. This procedure echoes the teaching method Blake encountered a decade earlier at the Pars’s School (where, as Bindman notes , he did not distinguish himself). See the record of Thomas Jones, quoted Bindman 227n12, and Janet Warner, Blake and the Language of Art (Montreal: McGill-Queens UP, 1984) chap. 2. Despite some awkwardness, especially in the early pages,, the work shows real ability for a 10 or 11 year old boy. He was evidently aiming at a kind of academic realism: later pages include heads of women with eighteenth-century hats and hairstyles as well as carefully detailed drawings of birds, animals and a rural scene. But his pedestrian manner contrasts strongly with the abstract and archaic but imaginatively expressive figures of the authentic drawings by Blake’s brother found in the Notebook of William Blake and elsewhere, and indeed the drawings that served as the boy’s models have a more assured and detailed grasp of human anatomy than Blake’s own work at the time.24↤ 24 For Robert’s work, see The Notebook of William Blake, ed. David V. Erdman (Oxford: Clarendon, 1973) NN. 1, 3, 5, 7, 9; Butlin 1: cat. R2-R11, 2: pls. 176 and 1178-90. For Blake’s early drawings, see Butlin 2: pls. 71, 73, 106, 107, et seq., and Bindman’s comment (“an almost complete lack of natural dexterity”), Blake 16-17. It is hard to see these sketches as the work of either William or Robert. A final argument against linking the Sketch Book to Blake’s teaching Robert in 1777-78 is the date implied in Smith’s account—that the lessons occurred during Blake’s partnership in the printshop, i.e., around 1784, two years after Robert’s supposed entrance at the Schools and not, as Bentley suggests, prior to his enrollment.25↤ 25 BR 20. Both Erdman (Prophet 98) and Jack Lindsay (William Blake [New York: Braziller, 1978] 33) also accept a date as early as 1777 for the lessons on the evidence of the Sketch Book. Whatever the instruction amounted to, its purpose was probably to train Robert as an assistant with his engraving, as Blake later did with Catherine—a supposition which gives point to the vision of Robert later providing Blake with his most valuable trade secret. Although Keynes and Butlin accept the attribution of the Sketch Book to Blake’s brother, both Bindman and Essick are quite doubtful.26↤ 26 Keynes 4-5; Butlin I: 617; Bindman 232n3; Essick, Huntington 235-36. Apart from its dissimilarity to the brothers’ work, the provenance of the book, as given in a long note inside the front cover by an unidentified hand sometime after 1878, is suspicious. The note claimed begin page 88 | ↑ back to top onetime friend Thomas Stothard after his death in 1834 and again in the sale of Sir Alexander Spearman’s books in 1878; thereafter it disappeared, to surface again in 1919 when it was purchased for the Huntington Library.27↤ 27 Butlin 1: 617; Keynes 5-6. However, it was not listed among the 1500 items in the catalogue of the Stothard sale or (apparently) in that of the Spearman sale.28↤ 28 BB 656 and cf. 661, where the Spearman sale is not included in Bentley’s chronological listing of catalogues mentioning Blake’s work from 1780 to 1974—though it may have been omitted as of minor importance (cf. 649). Wherever it came from, the book was not linked to Blake’s brother Robert till a century after his death by its nameless late nineteenth-century owner, whose note may not have been a deliberate fabrication so much as a bit of wishful thinking. Moreover, there is no reason to think that Blake would have given Stothard such a treasured memento as this Sketch Book if indeed it was his brother’s: there is no evidence of a close friendship between Robert and Stothard, but rather a seven if not a 12-year difference in age, and Blake had ceased collaborating with Stothard a year before Robert’s death, perhaps as a result of a cooling of their friendship.29↤ 29 See BR 611, also Blake’s 1803 letter to his brother James (E725) on the break in their friendship some years earlier. All in all, it is a more likely guess that the book belonged to the other Robert Blake—the precocious lad who entered the Royal Academy Schools at 14. If then Blake’s youngest brother was not the Robert Blake enrolled in the Schools in 1782, who was he, or rather when was he born? The preponderant evidence seems to point back to Symons’s conjecture—that he was in fact the mysterious Richard Blake conjured into being in June 1762 by a slip of the parish clerk’s pen. Several other considerations support this hypothesis. First of all, the absence of a death record for Richard Blake (or any other record subsequent to that of his birth) suggests that a child of that name never existed. That a death record is also lacking for the first John is not material: he may have died elsewhere than in London, as Bentley suggests, or even have been the son not of James but of John Blake, the father’s name given in the entry of his birth, and lived to maturity for all we know.30↤ 30 Bentley raises this second possibility only to argue against it (BR 3n3). It should be noted that eighteenth-century parish records are far from complete, and the definitive central register at Somerset House of all births and deaths occurring in Great Britain was not established till the passage of the Births and Deaths Registration Act in 1836 (Encyclopaedia Britannica, 11th ed. [Cambridge UP, 1910] 3: 990). Second, Blake’s mother, who was born around 1722, would have been 45 in 1767, the supposed date of Robert’s birth: a not impossible age for child-bearing, but an improbable one, especially considering that this would have been her seventh child. Again, the close intimacy between William and Robert, which probably dates from Blake’s return home at the end of his apprenticeship in 1779, is far more likely to have been based on a five than a 10 year’s difference in age. 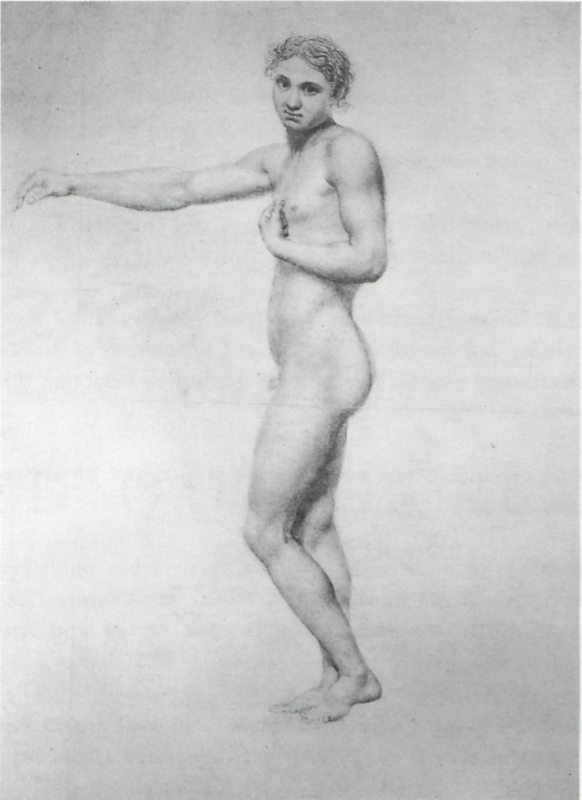 The “Academy study” of a naked youth seen from the side, dated c. 1779-80, which Keynes took to be a portrait of Robert represents a youth of about 17 or 18, not a boy of 12:31↤ 31 Butlin 1: cat. 71; Keynes 4 and pl. 1. and though both date and identification are tentative, this too would support a birth date for Robert of 1762 rather than 1767.32↤ 32 The fact that Robert’s birthdate is given as 1767 in the London section of the Mormon Genealogical Register does not prove Bentley’s theory, since the source given is Bentley’s own Blake Records. Unfortunately the other Robert Blake (born in August 1767) is not listed anywhere in England, in London or outside: but this proves nothing, since the Genealogical Register relies on fragmentary parish records for its information. The most telling argument against the Bentley hypothesis, however, is the fact that the only two early biographers to mention Robert’s age at the time of his death in February 1787 both gave it as 24: Tatham, whose information came from Blake’s widow, and Gilchrist, who never saw Tatham’s Life and relied on other informants such as Linnell and Palmer, both of whom knew Blake well.33↤ 33 Tatham in BR 510; Gilchrist 51. Gilchrist placed Robert’s death “in his twenty-fifth year,” i.e., a few months before his twenty-fifth birthday in June. Bentley noted this testimony but was not convinced by it (BR 31, 510n1); yet the congruence of two independent records is impressive. That Gilchrist had not seen Tatham’s Life seems clear from internal evidence. His few direct citations of Tatham mostly concern matters not mentioned in Tatham’s own Life (cf. LWB 261, 366) and often appear to be based on oral reports (e.g. LWB 352); but where Gilchrist discusses matters which are included in Tatham’s Life his account either significantly departs from Tatham’s (cp. LWB 10 and BR 511, LWB 81 and BR 530, LWB 355 and BR 534) or contradicts it (LWB 85 and BR 521) or is attributable to another source (cp. LWB 31-32 and BR 517 and 459, LWB 351 and BR 471). 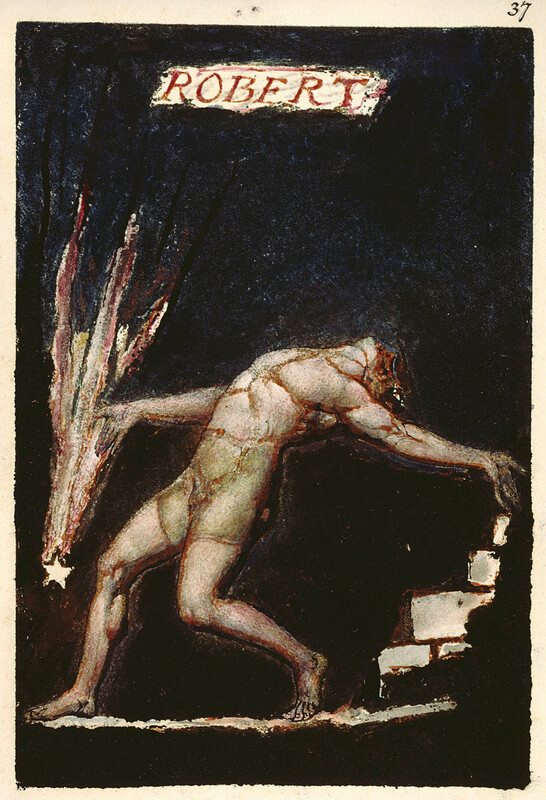 Though Gilchrist’s account of Blake’s midnight composition seems to derive from Tatham (cp. LWB 31-32 and BR 526n1), the unnamed “cordially appreciative friend” who supplied Gilchrist with this and much of his other information is almost certainly Samuel Palmer in one of his frequent discussions with Gilchrist of matters probably familiar to all the Ancients. Gilchrist’s mentions of Tatham are infrequent and perfunctory compared with his own many cordial references to Palmer (cf. LWB 299). 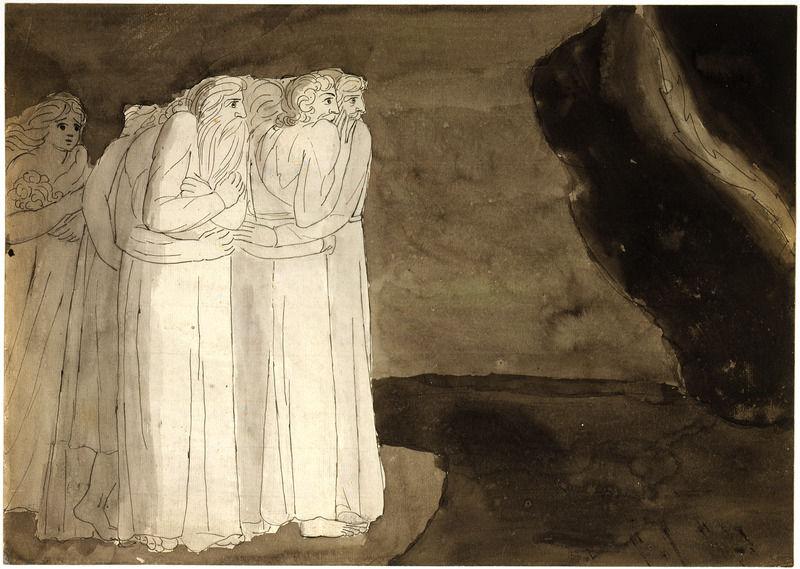 Thus, while Tatham’s information about Robert’s age at death was no doubt supplied by Catherine, with whom he became[e] familiar after Blake’s death, Gilchrist’s most probably derived from Blake himself through Palmer. By this begin page 89 | ↑ back to top account, Robert must have been born sometime between February 1762 and February 1763. Apparently it was their independent testimony that persuaded Symons that the name of Richard in the parish register for June 1762 must have been a clerical error for Robert; and indeed their record of Robert’s age at death is in the end the only explicit evidence we have for his birthdate.34↤ 34 Bentley points out in correspondence that even the evidence of a death date is not definitive: Blake’s brother James’s age at death is given wrongly as 71 in the perfunctory six-word entry in the Bunhill Fields Burial register when he as actually 73 and a half (cf. BR 340 and n4). However, James’s death was not the subject of any biographical interest that would have corrected the record, while Robert’s death was a matter of concern to Blake’s early biographers. Unfortunately his age is not given in the Bunhill Fields register as quoted by Bentley (BR 32). I wish to thank Professor Bentley for his generosity in reading the final draft of this article and offering perceptive criticism on this and other matters. Thus when all aspects of the question are considered, the conclusion seems almost inescapable: Robert was born in June 1762, not August 1767, and a slip of the pen accounts for the confusion over his name. More than merely revising the record, however, this investigation underscores a basic principle of biography. A single document, however impressive its credentials, cannot establish a fact apart from its total narrative context. The entry from the Schools register remains a tantalizing but isolated item, unsupported by any firm corroborative evidence, among the myriad minute particulars which the biographer of Blake must sift and assemble. Written evidence, while it can provide uniquely valuable information, can also be mistaken or misleading, and must therefore be scrutinized as carefully as all other kinds; conversely, non-verbal evidence may be admitted even where it appears to contradict the written evidence. In short, documentary evidence should not be privileged to the exclusion of all other kinds; we should remember how little of any life finds its way into written accounts, and keep our minds open to the mute testimony of things and circumstances and inferences from them. Every piece of biographical evidence, documentary or otherwise, must be viewed against the total experience of the biographical subject. It is the living context of each event that shapes isolated records into the semblance of biographical truth.